One of the marks of a great film is being able to capture sensations that transcend words. While most of my favorite films rely on great scripts filled with beautiful, expressive language, the best films never rely solely on their writing. Because film is a visual medium, it has the potential to capture something that is not possible in purely written form. Film can help express emotions and sensations that transcend words. 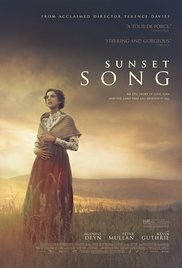 However, I ran into a challenging paradox in reviewing Terence Davies’ sumptuously literate Sunset Song, an adaptation of Lewis Grassic Gibbon’s classic Scottish novel from 1932. I experienced an emotion that was beyond my ability to verbalize, but was also the kind of feeling I have only previously experienced when reading words on a page. Specifically, Sunset Song is the rare literary adaptation to take the feeling of being immersed in a classic novel and translate it into cinematic terms. I went looking through every possible dictionary, internet forum, and literary blog I could find, searching for a word to describe that phenomenon. I was confident that I would find something in short order. My reasoning was that, if the old axiom holds that writers love to write about writing, then there should be some word to capture the general feeling of experiencing something in the written form. After an hour, I had turned up nothing satisfactory, so I turned to friends for assistance. An old friend, Matthew Byrom, suggested words like “literary” and “bookish”. Those are very fine words, but I needed something that spoke more to the subjective experience of being an entranced reader. I needed a word that conveyed that hushed state that falls over a person when their mind merges with the world of a novel. After a few hours, I was about ready to give up and just admit that some feelings really don’t have words to capture them. It was at that time that my very learned friend, Anne Peattie, came to my rescue with a word from that most efficient of languages: German. The word was “Lesengefühl”, which is literally the words “read” and “feeling” sandwiched together. There is nothing fancy about it. I imagined some German scholar, feeling just as baffled as I was, straining to describe this dreamlike sensation, and eventually blurting out “read feeling” in exasperation. The term is both simple and enigmatic, which is appropriate because I presume no one person’s “read feeling” is exactly the same as another’s. The read feeling is both universally relatable and impossible to entirely define, and that makes it a fine way of describing a film that is very much about the gulf between words and the inexpressible. The first image of Sunset Song is of golden wheat fields blowing gently in the breeze. As we float just above them, a young woman sits up from where she has been laying and pokes her head above the waving blades of grass. Her body becomes part of the landscape. This is our protagonist, Chris Guthrie (played with beautiful sensitivity by former model Agyness Deyn), a young woman on the border between adolescence and adulthood. Chris is the second oldest of four children living on a farm in early 20th century Scotland. The Guthries start the story in the town of Aberdeen, but are forced to move to a larger homestead after Chris’ brutish father, John, (the reliably brutish Peter Mullan) forces her mother, Jean, to become pregnant with two more children. The Guthrie clan piles into covered wagons and rides through the mud and freezing mist to the Blawearie farm in the fictional village of Kinraddie. Chris is a gentle, observant, and smart young woman with plans to become a teacher of language. She is an excellent scholar, fluent in Latin, French, and English. Much of Chris’ journey deals with a schism in her soul between the world of letters and higher education and the coarse, agrarian life that she feels makes her a Scot. Sunset Song is Chris’ story through and through, and the major dialectic battle is between the verbal and the ineffable, particularly as it pertains to the unspoken feeling of connection to one’s homeland. There is a part of Chris that desires to flee her homeland and a life that has its share of hardship. Chris’ life is a daily challenge filled with the arduous nature of farm work and the strain of living with a domineering, violent father. Much of this violence is inflicted on the eldest son, Will, who is in his twenties and looking for any opportunity to leave the old man far behind. Will despises this blunt, callous man, who recklessly forces their weary mother into having ever more children, and rarely ever has a tender word for any of his kin. Jean tells her daughter that the challenge of a woman in their day and age is to somehow survive the men around them. “You’ll have to face men for yourself when the time comes,” she tearfully cautions. The next morning, Jean poisons herself and her infant twins. With no mother in the house, the two youngest sons are sent to live with Chris’ aunt and uncle, leaving only Chris, Will, and their increasingly unhinged father to run the farm. One day, Will finally has enough money saved to run away to a big city and later to Argentina with a new bride at his side. On the morning her brother makes his escape, Chris cries at the window and watches him sprint down the muddy path with every bit of speed in his body. Sunset Song is the story of how Chris comes to outlive a tyrannical father and persevere long enough to see her life become her own. In time, she will taking over the Blawearie farm and flourish as the head of her own household. Chris will also fall in love with a young farmhand named Ewan, get married, and have a child, and she will proudly be able to say it was all of her own choosing. We watch Chris become the agent of her own destiny, while also learning to weather the gales of conflict and change. Chris’ tale is empowering, as she confidently cuts her own path to happiness and independence, but that is not to say that her life suddenly becomes easy. The juggernaut of the first World War soon tramples through Scotland, and the village of Kinraddie, sending most of its men away to Belgium to fight in the trenches. Ewan enlists out of shame, and when he briefly comes back for a furlough, the psychological torments of battle have made him angry and vindictive. It is as if he has been possessed by the demonic ghost of the late father Chris so hoped to be done with. Sunset Song is about the things that stay the same, like the ancient, green fields of the Scottish farmland, and it is about the passing storms of that blow however briefly across that landscape. As her mother warned her, Chris will have to learn to face men and survive them, whether that be an abusive father, the general sexism of turn-of-the-century Scotland (which forbids her from living alone at the farm she now owns), or a terrible war. In the end, Chris comes not only to embrace the eternal earth of Scotland in all its beauty and hardship, but to see herself as its natural extension; as an avatar of peace and steadiness in the midst of human turmoil. Our current film landscape is flooded with origin stories, but Sunset Song is a very rare and welcome kind of origin story. It is not the origin of a superhero, but of a strong, self-reliant, and endlessly sympathetic young woman. It is never my intention to force patterns on the films that make my list, but Sunset Song does have some interesting parallels with Things To Come, the film just behind it on my year-end list. In both cases, we come to meet and care for a strong, inquisitive female character, as she sets out to explore and understand the nature of how time changes people. However, while Things To Come is about wrestling with the fact that almost everything changes, Sunset Song is more interested in looking at what endures. Sunset Song is the story of those two poles in Chris’ spirit, the verbal and the ineffably terrestrial, and how she grapples with the choice of who she should become. For all her love of words, Chris comes to identify with the glens and ponds and meadows of Scotland because they hold fast. She sees strife and instability in the world around her, and she aspires to become a rock that can withstand it. Chris does what her mother cannot. She survives men, which is to say that she survives the perpetual chaos that men so often create. Happily, Sunset Song does not present a false dichotomy where men are utterly vile and amoral and women are virtuous damsels under constant threat from every man they meet. The film is a wonderfully lyrical character drama and its view of human folly and cruelty is honest, unflinching, but never unduly judgmental. Even a barbarous cur like Chris’ father gets the odd moment to be jovial, or thoughtful, or even encouraging of his daughter’s talents. Men are not devoid of goodness in their souls, but they are still a minefield that women must navigate. With all their capacity for kindness and love, men are nonetheless something that must be survived. If anything, the problem is that man, as a collective force, is never consistent. Chris’ father may have a moment of peace, but it will not prevent him from flying into a rage an hour later. One of the most unfailingly kind men in the film is an kindhearted older farmer named Chae Strachan, who dotes on Chris, treats her as an equal, and respects her as the driven, competent master of her own domain. But even he buckles when the trumpets of war sound for him. Even peaceable men leave their families to go participate in the whims of less peaceable men. Even Chris’ beloved Ewan goes off to fight and comes back as a creature of violence, fear, and shame, given to destructive impulses that he would have once stood against. And so, Chris learns she must plant her feet in the ancient dirt and become her own immovable object. Sunset Song claims eternal Scotland for its diligent, spirited, and long-suffering women. They persist, while the men take their leave for Argentina, Belgium, and the great beyond. Sunset Song is a lengthy film with a sprawling plot and a Scottish village’s worth of characters. It is the kind of film that gets referred to as “epic” and it is filled with flowery writing, either narrated by Chris in voiceover or spoken in splendidly acted dialogue scenes. It has stirring themes about change, the notion of country, family, and the desire to control one’s own fate, which it refracts through the lens of being a woman in a patriarchal society. And, now that I have used a lot of my own words to describe how verbally rich Sunset Song is, I must tell you that I find its words to be of secondary concern. Sunset Song succeeds on many fronts, but it positively soars as a beautiful, painterly, and tactile work of visual and aural art. It is a film that inundates you on multiple sensory levels. It overflows with texture, color, and sound. I do not know if I have ever had a good reason to gush about mud (at least not since turning six), but let me make up for lost time right now. Sunset Song is the most lusciously muddy film I have perhaps ever seen. Terence Davies presents the dirt of Scotland in so many different shades and states of wetness that I do not honestly have the words to accurately recount them. And that is important for two reasons. First, because a film so concerned with the idea of how people connect to the land of their birth really should give us a strong sense of what that land looks like. Secondly, in a film that presents land as something beyond the powers of words to describe, Davies puts his mud where his mouth is and lets Scotland speak for itself. One has to look at Sunset Song to really feel its impact, and the mud and dirt are only one small part of the film’s visual palette. Beyond that, there are impossibly green hillsides that shine brightly in the daylight and then mellow into darker shades of jade at dusk. The film has an incredibly sharp sense of weather and the shifting seasons, which helps it translate all those words about time and change into visual poetry. There is every matter of dew, rain, and fog. We see lightning strike a fencepost during a summer storm, sending off a shower of sparks into the rainy night. Chris and Ewan have a beautiful wedding on New Year’s Eve in a barn full of pine wreaths that you can practically smell. When the wedding is over, they walk out into soft snow that falls against the midnight blue backdrop of the sky. There are more gradations of sunlight than I could hope to name. Midday sunlight blazing down onto the workers in the fields. The gentle light of a temperate day that reflects off a small pond. And the pale, airy shafts of morning light that trickle into the Blawearie kitchen. Sunset Song is the kind of film with too much detail to ever catch in a single viewing. It was difficult to look down at my yellow notepad and scribble notes during my second viewing. I was always in danger of missing some rapturous image while I was vainly struggling to put the last one into words. On top of all the visual majesty, Sunset Song is also a superb feast of sounds. There is the soft squelch of human feet and wagon wheels in the mud, the hiss and roar of the drizzles and downpours, and the diverse chorus of Scottish burrs. I could honestly rewatch Sunset Song as a purely sensory experience, ignoring all its dialogue and plot developments, but I would still want the sound of those characters’ voices. And to give your ears even more to savor, Sunset Song fills itself with beautiful old Scottish traditionals, sung over the soundtrack and by characters within the film. In one of the few moments not set in Scotland, we journey to France and the frontlines of the war. We do not see any fighting, but instead scan aerially over an abandoned battlefield. The soundtrack swells with the strains of an old Scottish song, the same one that Chris softly sings at her wedding. The singer croons as we move over the wet, muddy land, all strewn with barbed wire and boots and wheels from old carts. An old Scottish voice sings a lullaby of home, though we are now looking at another country’s mud. I am not even certain now that I have a correct reading on what it all means, but I know that, like the rest of the film, it involves the mingling of land and rain and sunlight and music. And I know that I was utterly overpowered by its depth of feeling. When the film ended, the presence of the word “song” in the title suddenly made sense to me. There is something quite musical about its approach. I came to think of the dialogue as lyrics underscoring the music of its images and sounds. Sunset Song is gorgeous to experience with your eyes and ears and I think that is what makes it such an arresting movie, but it also has a very special, transporting kind of bookish quality. 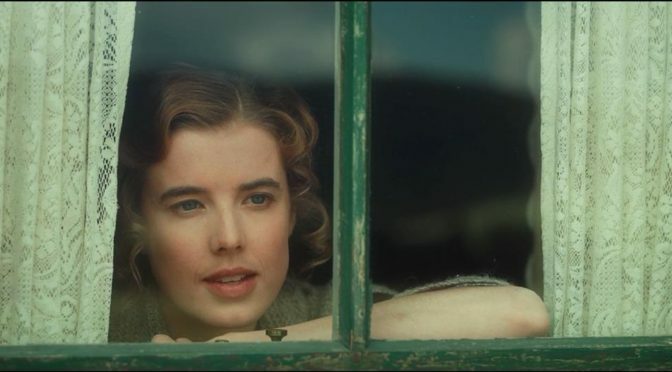 Even though Sunset Song probably spends more of its time visualizing the splendor of Scotland than it does on dialogue, it feels quintessentially literary. But, as I said before, “literary” is the wrong word for what I felt. Calling a film “literary” often has a slightly pejorative connotation. Plays that get turned into movies are often called literary when they fail to offer much in the way of a visual signature. It feels wrong to apply it to a film with an entire Scottish art gallery’s worth of breathtaking imagery. Sunset Song manages the nimble feat of making words feel sensory, just like a book does. This is what sent me off in search of a phantom word for that feeling. A feeling that has bewitched me since I was eight years old, when I first picked up a copy of Louisa May Alcott’s Little Women. “Read feeling” is just about right. Sunset Song does an amazing job of capturing the experience of sitting there in a warm room, with a great piece of classic literature. It gives us lovely words but is also just as interested in engaging personally with our imaginations. I think it may be the fact that the film is so visual that allows it to feel more like reading. Books have space for us to take a breath and get wrapped up in picturing the way a room or barn or field looks and smells and feels to the touch. By making the film adaptation of Sunset Song so intoxicatingly sensory, Davies approximates the process of setting the book down for a moment to draw the scene in our heads. He captures the act of reading better than a more verbal approach would. Reading is so much about the act of bringing our selves and our senses into the process, where details in our heads become more vivid than they would be in real life. For example, as I write this, I am sitting one foot away from a space heater turned up to its highest setting. It’s very warm. But if I pulled out my copy of Little Women, I would soon be with the March sisters, reclining in front of their roaring hearth. And the warmth radiating from this appliance would feel clammy by comparison. After two hours in the thick mud and cool, damp air of Sunset Song, only an imaginary fire could warm my bones.